Data: 128 paintings by Piet Mondrian (1905 - 1917) and 151 paintings by Mark Rothko (1944 - 1957). Mapping: X-axis: brightness mean, Y-axis: saturation mean. This visualization demonstrates how image plots can be used to compare multiple data sets. In this case, the goal is to compare similar number of paintings by Piet Mondrian and Mark Rothko (produced over comparable time periods of 13 years) along particular visual dimensions. See the full size image on Flickr. The project includes other visualizations and their analysis. Additional visualizations of Rothko and Mondrian from this project on Flickr. 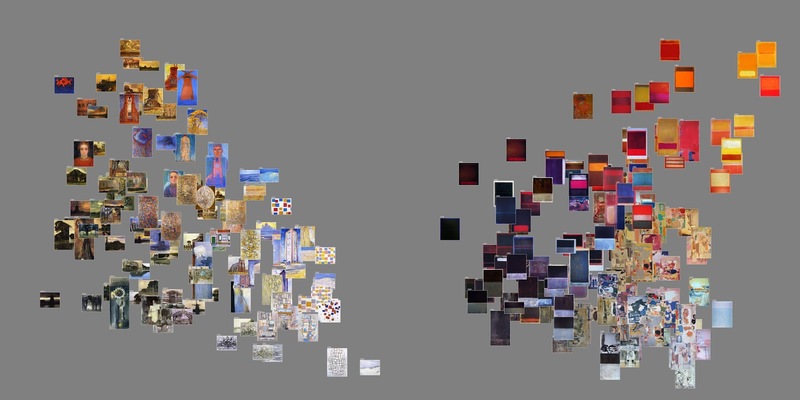 The visualization (2010) shows 128 paintings by Piet Mondrian (1905-1917) and 123 paintings by Mark Rothko (1938-1953). We have measured selected characteristics (features) of each paintings using image analysis software. In each plot, paintings are organized by average brightness (x-axis) and average saturation (y-axis). Projecting sets of paintings of these two artists into the same coordinate space reveals their comparative "footprints" - the parts of the space of visual possibilities they explored. We can see the relative distributions of their works - the denser and the more sparse areas, the presence or absence of clusters, the outliers, etc. All visualizations are created with free ImagePlot software developed by Software Studies Initiative.